The interactive and resizable nature of the PocketSmith calendar, unfortunately, means that printing may not look good. This is because most browsers strip away a lot of the style information when preparing a document for printing. These styles are responsible for rendering the calendar and events. We have a couple of solutions below that involve using browser extensions for Google Chrome and Mozilla Firefox. We think this is better than the browser's native print feature as it retains all the elements as you see them. Install an extension for your browser called Awesome Screenshot. 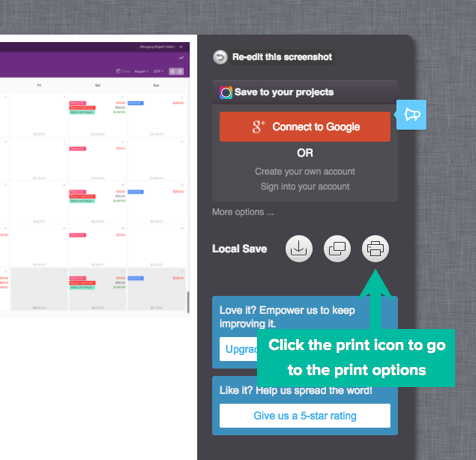 This allows you to snap a screenshot and print the interface exactly as you see it. The resulting print will be exactly what's on screen. Feel free to try some of the other options available in the capture menu, e.g. 'Capture selected area', so see if they suit you better. 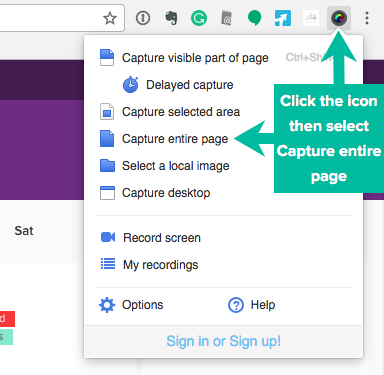 Install an extension for your browser called Capture and Print. When it's installed and activated, you'll see an icon for Capture and Print on the top right of your browser. Clicking it turns your screen yellow, indicating the printable area. Your mouse pointer will be a crosshairs icon. Drag the pointer over the area you want to print. When you're done, you will be presented with a printable page of the area. Print the document by going to the File > Print menu.